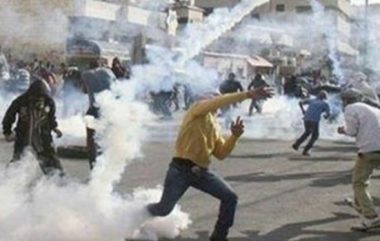 Palestinian medical sources have reported that one teacher and several students suffered the effects of teargas inhalation, Monday, after Israeli soldiers fired many gas bombs in and around their school. The sources said the teacher Amjad Tanneena, and scores of schoolchildren, suffered the severe effects of teargas inhalation, and were rushed to several hospitals in the city. The attack took place after dozens of soldiers surrounded the elementary school, and the areas around it, and started stopping and searching dozens of residents, including schoolchildren. Many Palestinians protested the violation, before the soldiers started firing gas bombs and concussion grenades at them. A week ago, the soldiers attacked the same school, wounding one teacher, and causing scores of students to suffer the effects of teargas inhalation.